The idea of local self-governance (‘Spoils of local bodies’, November 1-15, 2010) that purports to help the public is steadily becoming defunct as the panchayats are run by corrupt people with criminal background. Due to increased funding over the years, panchayat elections are being contested with great vigour, money and muscle power, and in the end it is the winner who walks away with all the moolah. The 73rd amendment to the Constitution is aimed at making panchayati raj institutions an effective instrument of local self-governance. But the power of money that has become associated with politics at all levels has made the little republics go haywire. While it is essential to devolve more financial powers and autonomy to the panchayats, such a greed-driven distortion comes as a severe jolt. Is it not time to think of reforming the system? This refers to ‘India gets ready for banana war’ (December 16-31, 2010). I would like to know if there is any effective measure to fight Fusarium oxysporum f.sp. 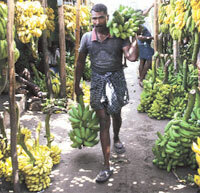 cubense, a virulent strain of a fungus that is affecting Cavendish bananas in India? If a banana plant is propagated using tissue culture the risk of the fungal disease spreading is negligible. Farmers should be encouraged to select disease-free planting material, plant them in diseasefree fields and follow crop rotation with paddy. Some bio-control agents have been identified to combat the pathogen but they are in field test stages. Bamboo should be taken out of the purview of forest timber produce (‘Is bamboo a tree or a grass?’, December 1- 15, 2010). This can be done by bringing in a one-line amendment in section 2(7) of the Indian Forest Act of 1927 which treats bamboo as tree. Even the Union Ministry of Environment and Forests could not have objected to this because the Supreme Court in its order dated February 18, 2004 had exempted bamboo from felling restrictions (imposed earlier by the court) on the grounds that it belongs to the grass family. According to Collins dictionary, bamboo is a tall treelike grass with hollow stems used to make canes and furniture. The book titled Tropical Crops: Monocotyledons by J W Purseglove classifies bamboo as well as sugarcane and other cereals like rice, wheat and barley under the grass family Poaceae. Before the Indian Forest Act, 1927, or other acts promoted by the British, the adivasis were using forest produce, including bamboo. These acts have not only robbed them of land rights but also violated human rights by not allowing them to use bamboo for building house. A bamboo variety called bhima is sterile. When established on a plantation scale, it can absorb 150-200 tonnes of CO2 per hectare per year and is perhaps superior to any other plant regarding carbon sequestration, according to N Bharathi, CEO of Growmore Biotech Limited, a Tamil Nadu company that provides tissue culture plants to farmers, industries and government departments. Forests in India sequester only two tonnes of CO2 per hectare per year. Forest officials could consider growing bamboo along river banks to prevent erosion. Laws are meant for public welfare. They have to be interpreted and enforced in such a way that their true spirit comes into force. Forest officials are no enemies of the public. They are saddled with dual responsibilities in conflict with each other—of protecting forest produce and distributing what needs to be protected. Thousands are reaping benefits from minor forest produces (MFPs), especially those in the tribal belts, thanks to the forest departments of all states (‘Major battle over minor produce’, November 1-15, 2010). They work efficiently in protecting forests from encroachers and exploiters of MFPs, and should not be projected as villains. A better way to maintain sustainable yield of the MFPs is continuance of restricted harvests under the supervision of the forest department without changing farming procedures and paying sale proceeds of MFPs after recovering service charges to right holder unions for distribution among themselves. The Forest Rights Act, 2006, has opened a Pandora’s box, leading to fragmentation of forests by granting tracts of forest land for cultivation and settlement. Without the forest department’s interference, who will ensure control over them? China has different ecological conditions compared to India, then why compare the countries’ rice yields (‘Saving rice’, December 16-31, 2010)? The support to rice farming is also different in the two nations. The pricing policies in India are highly disincentivised for farmers. The push for hybrids is to pave way for genetically modified rice in India and not for ecological or economic security of farmers. Telecom regulator TRAI’s decision to help cell phone users get rid of unsolicited telemarketing calls or text messages is welcome. As a rule only those subscribers should get calls from telemarketers who want to subscribe to such services. In addition, stricter punishment rather than a Rs 2.50 lakh fine should be considered for erring telemarketing companies. Such a provision would also take care of unregistered dealers because under proposed rules registration is a must for telemarketers. Similarly, spam or unwanted email, should also be covered. Farmers are aware of the health hazards from excessive use of endosulfan (‘State of endosulfan’, December 16-31, 2010). They do not want to use it but are not confident of the available alternative pest control methods. So they turn to the pesticide which wreaked havoc in Kerala. 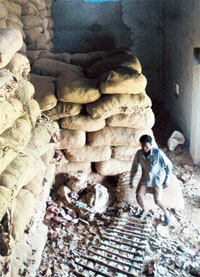 The government should extensively propagate the advantages of alternatives of endosulfan. Endosulfan is a poisonous pesticide which causes reproductive and developmental damage in animals and humans. This has been proved many times. Does India still need more proof? Endosulfan is a known carcinogen. 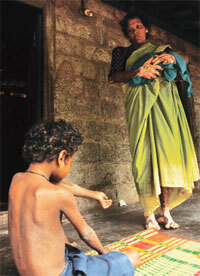 Seventy-three countries have phased out or banned endosulfan. A handful of countries, including India, China and Israel, have however opposed its ban. Kerala has been pressing the Centre to impose a countrywide ban on the pesticide after several families in the state’s Kasaragod district were found affected by aerial spraying of endosulfan. An online petition should be prepared and sent to the prime minister so that we do away with the pesticide once and for all. Since becoming India’s capital, Delhi has grown in size. The government has made every possible effort to turn Delhi into a world class city despite limitations like overpopulation. Polluting industries have been closed or shifted outside the city; and vehicular pollution has been reduced with use of compressed natural gas. But a lot needs to be done. Many people in Delhi live below the poverty-line. To them, food, shelter and clothing are the main concerns. Factories which lack proper pollution control devices produce cheaper products for low-income consumers. When it comes to Delhi’s affluent section, environmental conservation is perceived as a luxury. The rich are always on a lookout for a better environment, such as cleaner air and quieter neighbourhoods. They are ready to buy products that carry “eco-friendly” labels and are expensive, like organic vegetables. Article ‘Suppressed CNG Facts’ (January 1-15, 2011) states on p46: “Methane exhaust from CNG engines is 12 per cent lower than that from diesel engines. Methane emission from CNG is even lower if one compares the life cycles of the two fuels.” It should have read: “Methane does not affect local air quality but is a global warming pollutant. Yasoram Group, a Kochi-based organisation, has proposed to the Kerala Coastal Zone Management Authority to construct a flyover in Kochi to reduce traffic congestion and boost tourism and other economic activities. According to the plan, the 4-km flyover that spans over the Chilavannur lake would extend from Kundannoor near national highway 47 bypass to Subhas Chandra Bose road. Called Yasoram Skycity, the project violates coastal regulation zone norms. The project includes 158,000 square metre of commercial space, including shopping malls, amusement centres and water sports facility, at the flyover’s entrance. This will attract more vehicles leading to heavy congestion. Yasoram Skycity presupposes that roads included in the project are fully developed and functioning. At present, these roads have no linkages to any of the main arterial roads of Kochi.